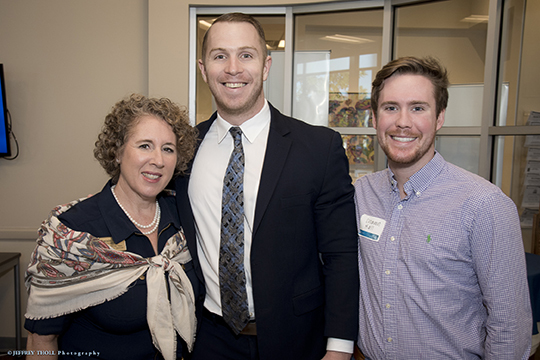 State legislators and their staff gathered with Jewish community leaders at the Shirley & Barton Weisman Delray Community Center on December 13 for the Jewish Community Relations Council’s annual Legislative Sendoff. Following greetings and expressions of gratitude for the supportive delegation, three Federation beneficiary agencies shared the needs of vulnerable local residents, and their corresponding funding requests for the state budget year ahead. Danielle Hartman discussed JFS needs to provide Holocaust survivor assistance and conduct the Weisman Center’s senior activities; Nancy Friewald presented JARC’s funding needs for those with intellectual disabilities and autism to work in the community; and Andrea Kalkstein discussed transportation support needed by FTS for seniors and people with disabilities. The group also heard from State Senator Kevin Rader, and State Representatives Lori Berman and Emily Slosberg, who pledged their efforts to aid the agencies in the 2018 legislative session. Also represented at the event were staff members from the offices of Congressman Ted Deutch, State Senator Bobby Powell, State Representatives Joseph Abruzzo and Bill Hager, as well as Christine Shaw, Executive Director of the Palm Beach County Legislative Delegation. The JCRC will lead a visit to officials in Tallahassee as part of its ongoing advocacy efforts throughout the legislative session.